In the world of SEO, and online marketing, we use a lot of tools. In fact, I could create an entire blog dedicated to the top 100 SEO tools and bore you out of your mind. It’s the kind of material we geek out on here at Mockingbird HQ. And typically, I’d advise most attorneys to not worry about SEO tools, and to steer clear – but there is one tool that every attorney needs on their website. And it’s not just attorneys – every business needs this tool on their website. Okay, so there’s actually three different must have tools I’d advise having on your website. And, they’re all free. For now, we’ll focus on numero uno. But, for the sake of keeping you well informed, here are all three. Every website should have each of these installed, and when we have new clients who don’t have them installed – it’s the first thing we do. However, if you’re running a law office we know that you’re busy with other things. So, if there’s one thing you’re going to do for your website this week, you can start with Google Webmaster Tools. And, if you ignore the other two, you’ll still be 100% better off than you were before. Why is Google Webmaster Tools SO Important? Google Webmaster tools is a free tool provided by Google, and it’s one of the best ways to keep tabs on the health of your website. For an advanced marketer, there are numerous insights and pieces of data they can gather to help diagnose website issues and improve search engine performance. However, you don’t need to be trained in SEO to get the most value out of webmaster tools. The best thing about webmaster tools is that it will alert you to any HUGE SEO ISSUES on your site. So, if you have some big time problems, you won’t need to sort through the data to recognize that you have a problem. Google will actually send you an email and say, “Hey, I think you have an issue here. You should check this out.” The following are a just a couple of examples of issues that Google webmaster tools will alert you to. Are You Unknowingly Promoting Viagra? One of the worst things that can happen to your site is having it hacked. In some cases you’ll actually notice obvious issues on your site if it’s hacked. Maybe overnight you’ll see links appear on your homepage pointing to online casinos and viagra websites. That’s an obvious sign. But, the most mischievous hackers are clever, and you might not even notice if you’ve been hacked. The example above is from a website that had been hacked and showed no signs of it when you looked at it. However, shortly after setting up Google Webmaster Tools, the above message was received. It turns out that the site had been previously hacked, and the culprit had created hundreds of hidden pages on the site for viagra and cialis. All of the pages were linking out to other websites. This is a VERY bad thing. Google is all about providing a good “user experience”. Directing people toward a hacked site is not generally considered a good user experience. This would be the equivalent of you asking me where to buy a flat screen, and then I point you down a dark city alley. Even if your hacked site poses no real threat to a visitor, Google has no reason to point people to your hacked site when there are 10 other attorneys in your area whose sites haven’t been hacked. All that to say – if you’re site has been hacked, you’ll most likely see a correlating drop in search traffic to your site as well. But the best way to know if you’re site is hacked? Simply install webmaster tools. That’s ALL YOU NEED TO DO! Then you just watch for emails with messages like the one above. Above is a message you never want to receive from Google Webmaster Tools. This typically happens to people who have paid someone to create links to their site which generally results in thousands of overly optimized links pointing to your site, from pages that have no credibility or relation to law. This automatically flags Google to the fact that you’re spamming the internet to try to game their search algorithm. And in particularly atrocious instances Google will actually place a manual penalty on your site, thus crippling any web traffic you have. 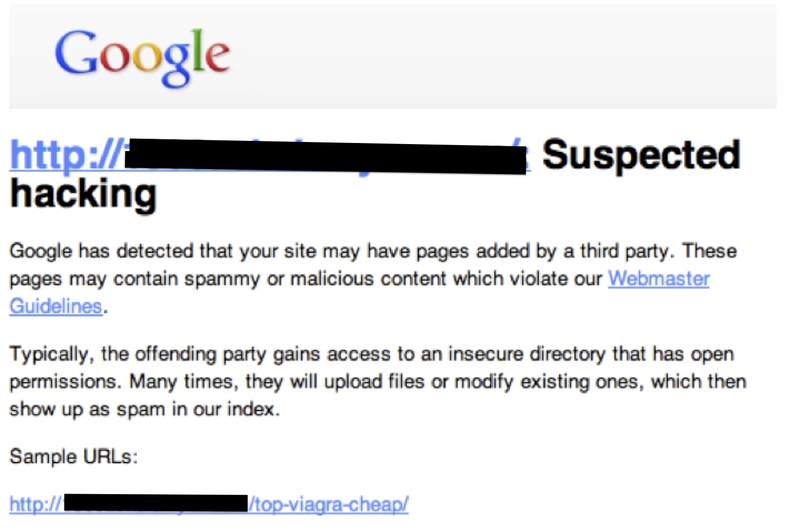 If you do though, at least install webmaster tools so you know when google slaps a manual spam penalty on you. But seriously, DON’t BUY LINKS! You might be thinking to yourself, “Oh, well we’ve never purchased links to our site. I don’t need to worry about this.” On multiple occasions we’ve had attorneys tell us they’ve never purchased links. But when we setup webmaster tools we see thousands of purchased links. It’s not that these guys are lying to us about purchasing those links. Unfortunately they’re just not aware of the tactics past SEO agencies have used on their website. Unfortunately, it’s actually quite common because a lot of SEO agencies used to heavily use this tactic to boost their clients search rankings. 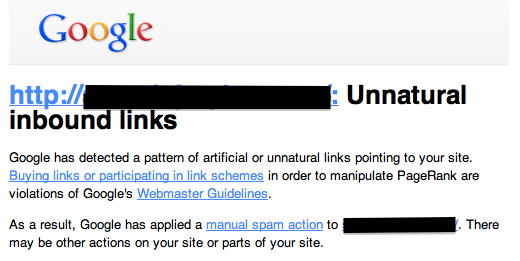 So, if you’ve ever hired an SEO agency, you could indeed have “unnatural inbound links” that are hurting your site. Fortunately, if you install Google Webmaster Tools they’ll send you an alert like the one above if they find unnatural links on your site. Cleaning up those links can be a nightmare, but step one is simply knowing you have the problem. Setting up Google webmaster tools is incredibly easy. Here’s what you need to do. 1) Got to Google Webmaster Tools and login using your Google account. If you don’t have a google account or email address, you’ll need to set one up. 2) Click the bright orange “Add a Site” button. 3) Enter Your website domain in the following window. 4) Then verify that you own the website. 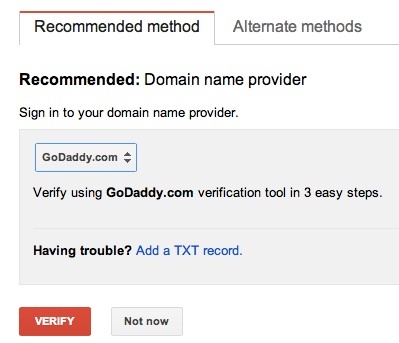 This can be done several ways, but the easiest and Google recommended way is to verify by logging into your domain host. You’ll simply find your domain name provider from the drop down list, and then follow the instructions given to verify your account. Done? Congratulations, you’ve just setup one of the most important SEO tools you could ever have on your site. There’s a lot of information in Google Webmaster tools which I’m not going to go into detail on here. By simply installing this on your site though, you’ll already receive some of the most important updates via email. If Google thinks your site is down, you’ll receive an email. If they give you a penalty for buying links, you’ll be notified. There are a number of technical issues which Google will alert you to – and many of these issues have cause a profound impact on your business if you receive new clients through your website. You don’t need to know how to fix any of the issues you may encounter. You just need need to know about them, so you can get assistance.